Moving offices? Replacing furniture or equipment? Changing things in the workplace can involve a large amount of upheaval and it is important to minimise disruption as much as possible. It can often feel like a great challenge to organise the clearance of office items, and it can take up valuable time that you could be spending on your company. Why not let us take over and organise the process to suit your schedule? Popular with business owners and home owners alike, the Lucas Waste Removal office clearance service is professional and reliable, fully insured and licensed and adheres to current Health and Safety legislation for your peace of mind. 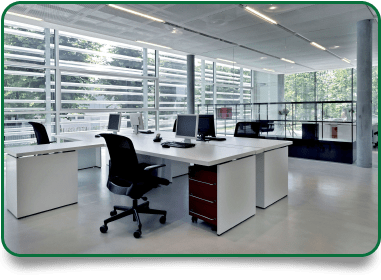 In order to ensure a smooth running project, Lucas Waste Removal will organise an office clearance that perfectly suits your business arrangements. Any nature of office removals can be covered, from large to small, to suit your deadlines. Whether it’s just a few items, or an entire office clearance, we offer a discreet, compliant and confidential service for corporate waste removals. You can book a time with us that works around your schedule, and there will be a two-hour window of arrival for our team. If you need us to work out of business hours or over a weekend, that’s fine. We will call you half an hour before we arrive on the scheduled day, and begin the removals. We will collect and remove your office equipment as needed, from electrical equipment, such as printers or scanners, to the furniture of an entire office. Moving quickly to suit your deadlines, you’ll be able to get back to business as soon as possible after removals, receiving a professional, courteous service at all times. You will be provided with WEEE certificates (Waste Electrical and Electronic Equipment) for everything removed, free of charge. We will also provide you with a waste transfer note for your records on completion of the removals. All of your waste will be disposed of responsibly, and in an environmentally-friendly way, where possible. Contact us today on 020 8773 4000 or 07885 768 939 or use the contact form on our website to see how we can take care of your office clearance needs for you.